Phu Quoc and Koh Rong are located in Thailand Gulf with the beautiful landscape and warm sunny climate all year round, which one will be the ideal destination for tourist in this summer? Let’s check! Where Phu Quoc and Koh Rong are located? Phu Quoc, also known as Pearl Island, is the largest island in Vietnam located off the southwestern coast of Vietnam. Being one of 22 islands belonging to Vietnam sovereignty located in the Gulf of Thailand and the largest one in the area, Phu Quoc together with other islands has created Phu Quoc island district, Kien Giang province, whereas, Phu Quoc island plays the political, economic and cultural role in the island district. With the area of 589,23 sq km, which is approximately the square of Singapore, Phu Quoc has all types of terrain and landscapes from the sea, river delta to the mountainous area. Duong Dong town is the capital of the island located in the west of the island. Away 120 km from Rach Gia city and 45 km from Ha Tien city, it is easy to travel to Phu Quoc by boat from two destinations. In 2006, Kien Giang coastal and marine biosphere reserve including Phu Quoc island district is recognized by UNESCO as a world biosphere reserve. 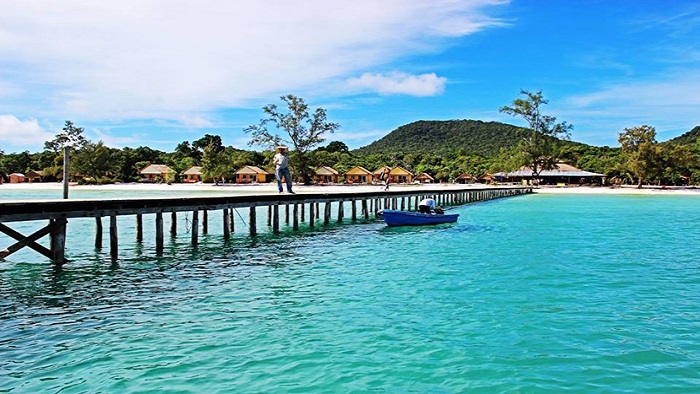 Koh Rong is the second largest island in Cambodia with an area of ​​78 sq km. According to Cambodia's administrative decentralization, the island is located in Mittakpheap district of Sihanoukville province, including four villages: Koh Tuich, Doeum D'keuw, Prek Svay and Sok San. In recent years, this island has become a tourist resort. Since there is no basic infrastructure, boat transport is required for all settlements and resorts scattered across many beaches. The only way to get to Koh Rong is by boat. In order to visit Koh Rong, tourists have to catch a ferry from Sihanoukville, it takes one hour to move with the fare of $22. Then you will come to Koh Touch beach, if you want to go to other beaches in Koh Rong from this beach, you will have to take a taxi boat to move with the cost of about $7/person/ one way. Koh Rong is still an unspoiled island and the infrastructure of the island is considerably nonexistent. There are some homestays in the area with limited services, especially fresh water. Although there are some projects to promote the tourism development of the island, it is incomplete. Although Koh Rong is an island, the food service on the island has not yet developed. Koh Touch beach is the best beach with a variety of food, however, on the beaches such as Sok San, Coconut beach, there are only a few food options for tourists to choose. Most of the restaurants are accompanied by hotels. There are two options to get to Phu Quoc, that are by plane and by bus and ferry. You can catch a straight flight from Hanoi, Ho Chi Minh city, or Can Tho to Phu Quoc International Airport on Phu Quoc island. If you have a tour in Mekong Delta, it is great to enjoy the peaceful landscape there and then take a bus to Ha Tien or Rach Gia city in Kien Giang province, you continuously catch a ferry to get to Phu Quoc island. Depending on the type of ferry you choose, the trip will take 45 minutes (fast boat) or 3 hours and 30 minutes (slow boat) to reach to Phu Quoc. The itinerary from Mekong Delta to Phu Quoc will definitely give you a wonderful experience. The accommodation to provide for tourist in Phu Quoc is quite complete. Phu Quoc has a great road system with wide and smooth roads. You can go around the island by taxi or motorbike. If you want to explore Phu Quoc by yourself, it is recommended to rent a scooter, it costs around $4-$5 per day. The boat tours Phu Quoc are also available for tourists to explore the sea of this island. The accommodation system in Phu Quoc is also great with a wide chain of accommodations from luxury hotels and resorts to homestays and motels. If you are traveling on a budget, we recommend you to book a room in homestay or 2-star hotel, the room cost ranges from VND 500,000 to VND 900,000. If you want to enjoy a luxury vacation, you should book a room in 4-star or 5-star hotel, room rates range from $90 to $400. You will not worry about where to eat in Phu Quoc because food in Phu Quoc is really various. When traveling in Phu Quoc, don’t forget to try out the seafood. Besides that, there are numerous specialties such as Phu Quoc sim wine, black pepper, herring salad, etc. 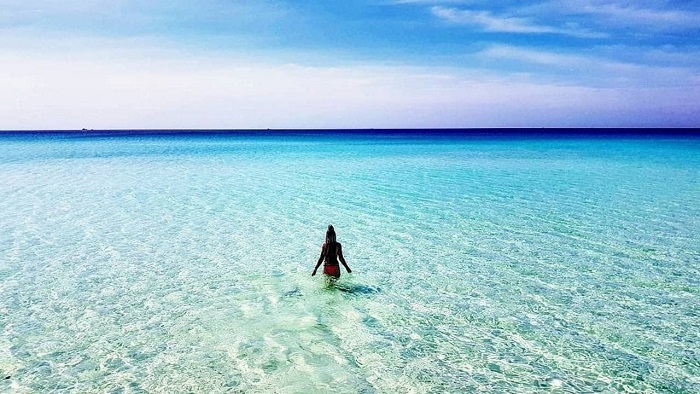 Both Koh Rong and Phu Quoc are the large islands with beautiful landscape and warm sunny climate. It is the suitable places for relaxing and traveling. However, with the perfection of transportation, accommodation, and food, Phu Quoc is a great option that tourists should consider to visit this summer. 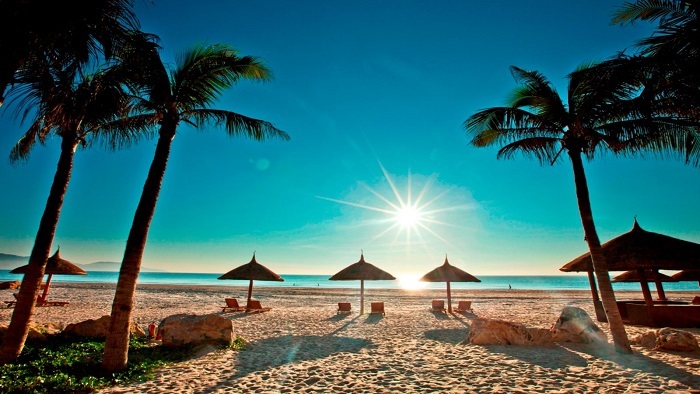 Phu Quoc is a valuable jewel of Vietnam tourism. If you have a plan to travel in Southeast Asia, let’s visit this beautiful island right this summer. Thank you!